What began nearly eight years ago as an event more tightly focused on Liberty magazine and its first 100 years of publication has grown even more historic. What began as an event almost completely funded by Liberty magazine has grown into a shared financial endeavor that highlights many facets of the Seventh-day Adventist religious liberty leadership role. What began as a focus on recognizing individuals of distinction in the religious liberty field has, curiously widened both ways: the awardees now cover the entire international field and more of the attendees are grassroots religious liberty activists from all over the United States and Canada. The 2009 Seventh Annual Religious Liberty Dinner—held at the downtown Washington, D.C., Hilton to allow a greater number of people to participate—was arguably the best yet and showcased the changing and expanding role of the event. Many faiths and viewpoints were represented by the audience of religious liberty activists, a number from the Washington political establishment, and various ambassadors. While in the past we heard from political leaders such as Hillary Clinton, John McCain, and John Kerry, the speaker at this Seventh dinner, Emanuel Cleaver II, is by way of his cochairmanship of the International Religious Freedom Caucus in Congress a true insider in the battle to maintain religious freedom for all. Denton Lotz, general secretary emeritus of the Baptist World Alliance, in accepting the International Award, spoke for many when he said, “We are here tonight as coreligionists of all the major traditions because we believe that religious freedom is an inherent right for all humanity. We believe that where religious freedom is denied, all other freedoms are denied.” His assertions were underscored not just by the message and presence of the National Award honoree Rabbi David Saperstein, director for the Religious Action Center of Reform Judaism, but by the testimonial given by Iranian-American Keveh Khansari Nejad. His search for religious freedom led him from his ancestral faith in Iran to a new Christian identity in the United States—and a continuing struggle for accommodation of his minority religious identity. The event closed with a rousing musical rendition of the famous Emma Lazarus poem—with music by Irving Berlin—“Give me your tired, your poor,” and we could appreciate again the yearning to be free, to have freedom. 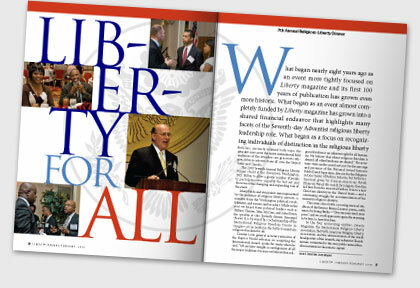 So the four sponsoring entities, Liberty magazine, the International Religious Liberty Association, the North American Religious Liberty Association, and the administration of the world headquarters of the Seventh-day Adventist Church remain committed to this very public annual freedom initiative in the nation’s capital.